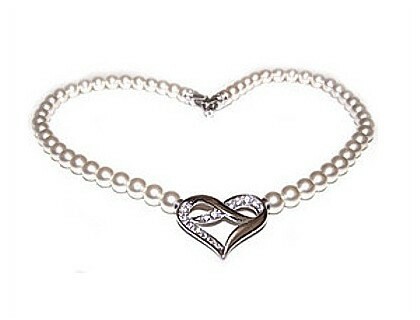 With pearls once again the hot fashion trend, MAJ brings you the most deliriously romantic necklace featuring the eternal symbol of love - the heart - encrusted with exquisite Swarovski crystals and set on an ivory glass pearl necklace. SIZE: Heart Drop: 23mm (almost 1"). Width: 28mm (just over 1"). Length: 43.8cm (17¼") or 41.2cm (16¼") Matching bracelet and earrings available.